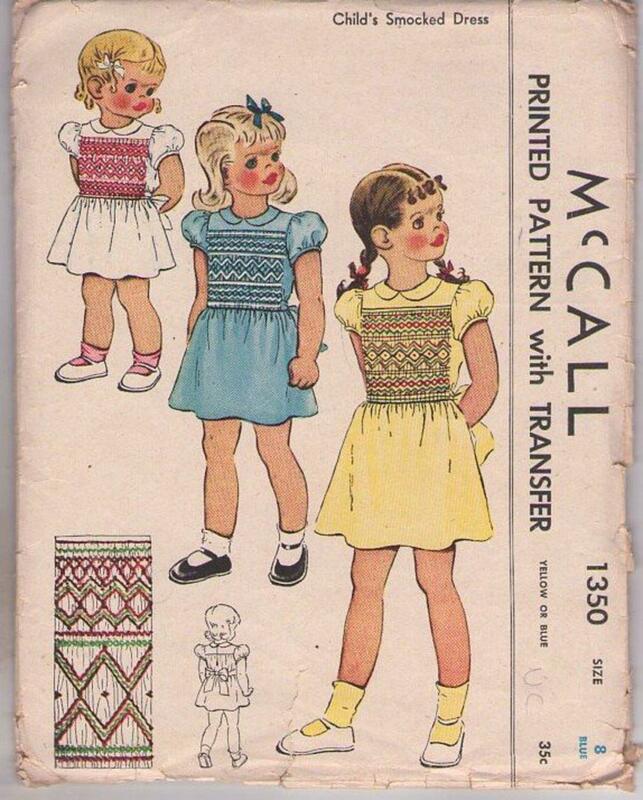 1949, 40s Children, Retro School Clothing Patterns - Child's Smocked Dress with Blue or Yellow Transfer. An attractive front fullness, held in by the many pleats in the smocking, makes this a smart dress! Combine several bright colors in the smocking. Dress would be very nice in yellow with smocking done in bright blue, red, green, brown. A section of this beautiful smocking design is shown above. Step by step details for smocking included in the pattern. CONDITION: This Original Vintage Sewing Pattern is uncut & unused. All pieces appear to be complete and intact and have been neatly refolded with the original instructions. Minor edge wear.